Threads chosen specially by Sue (Eleganza, Efina, Ellana) as well as books, patterns and other products. Fun 40wt 100% polyester thread designed to glow brightly in the dark! Sturdy 6-ply thread (comparable in weight to a #8 perle cotton) 100% rayon and metallic mix with a silky finish. 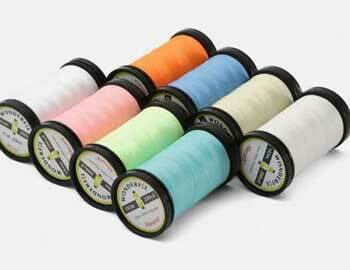 80wt 2-ply polyester thread with a textured matte finish, delicate but incredibly strong. Also available on convenient prewound bobbins. 40wt polyester thread, reliable and all purpose. A premium sewing and serger thread in more than 200 solid colors. Available in 3 weights, 100% Giza 88, the highest caliber extra long staple Egyptian cotton. Use for wool appliqué, hand embroidery, Sashiko and more. 12wt Egyptian cotton thread with a bold and dramatic look, ideal for showing off your stitching and designs. 12wt, 2-ply rayon thread with one strand of metallic: use it to embellish any project where you want the stitching to be the star. 100wt, 2-ply cottonized polyester, ultra-fine and soft... but surprisingly strong with negligible stretch. 50wt, 3-ply mercerized Egyptian cotton: a popular choice for quilting and longarming due to its quality finish and low bulk. 30wt rayon thread with a beautiful sheen, randomly space dyed in variegated colors: every spool is unique! Polyfast is a 40wt trilobal polyester with a brilliant shimmer and excellent strength, ideal for machine embroidery. A sturdy 6-ply, 100% rayon thread with a natural bright luster and silky feel. Woven with three strands of metallic, this is the ultimate thread to add a lot of texture and dimension. 12 wt, 3-ply, 100% long staple Egyptian cotton, a bold and dramatic thread. 40wt rayon 2-ply thread with a soft and silky finish for machine embroidery, thread painting, and more. 40wt rayon core metallic thread ideal for machine embroidery, decorative stitches and even quilting.